Total costs to book a Jenner Vacation Rental are the rental rate (higher on Friday, Saturday nights, holidays, and high summer season + Housekeeping fee + 11% Sonoma County taxes + a $20 booking fee. Instant quotes or total costs are displayed on our website when booking on-line. A (1) night stay cannot be accommodated. There are (2) night minimum or (3) night minimum stays during July & August. No exceptions. All vacation home rates are posted at the lowest rates. Special rates are posted on the ‘Specials’ page (tab on website homepage). Week rates are by far the best rate. All Bookings are taken on-line at www.JennerVacationRentals.com website. Payment is made in full at time of booking with a credit or debit card. There will be an option to order travel insurance at time of on-line booking. Acknowledgement of Jenner Vacation Rentals Policies & Advisory is required for on-line booking confirmation. After booking on-line, an automated email confirmation will be sent immediately with the vacation home driving directions & specific vacation home rental information. Print driving directions and bring when traveling to your vacation home. As a part of your stay, you may purchase a Vacation Rental Damage Protection plan designed to cover unintentional damages to the rental unit interior that occur during your stay provided they are disclosed to management prior to check-out. If purchased, the policy will pay a maximum benefit of $3,000. Any damages that exceed $3,000 or are not covered under the plan will be charged to the credit card on file. If, during your stay at one of our rental properties, an insured person causes any damage to real or personal property of the unit as a result of inadvertent acts or omissions, the Insurer will reimburse the Insured for the cost of repair or replacement of such property up to a maximum benefit of $3,000. Certain terms and conditions apply. Full details of the Vacation Rental Damage coverage are contained in the Description of Coverage or Insurance Policy www.vacationrentalinsurance/g20vrd. The Vacation Rental Damage can be purchased up to, and including at, check-in. By submitting payment for this plan, you authorize and request CSA Travel Protection and Insurance Services to pay directly Jenner Vacation Rentals any amount payable under the terms and conditions of the Vacation Rental Damage. Payments for bookings are refundable only when Jenner Vacation Rentals can book the cancelled dates. When canceling there will be a $50 non-refundable fee for cancellation. When your dates are booked (by another guest), a refund will be given minus the $50 cancellation fee. Travel Insurance is available and strongly suggested. Transfers from one house to another are accepted for the same dates if transferring within 48 hours of booking confirmation. There will be a $50 transfer fee. Prior to your arrival (not same day as arrival) contact Jenner Vacation Rentals for an updated key access code for vacation home lockbox entry. New codes will be available (1) week prior to your arrival. Due to housekeeping & pre-rental guest check schedules we cannot accommodate late checkouts or early check-ins. A Guest Directory is provided at all Jenner Vacation Homes with specific home information, area emergency contact information, detailed policy information, area information, and a place to share your memories during your stay with others. No smoking allowed in any Jenner Vacation Rentals or on premises. Due to constraints of the septic system, parking and neighbor/noise issues, rentals can only accommodate the number of guests the rental sleeps. This includes guest visits. There will be a charge of $100/person per night if reported to Jenner Vacation Rentals by the neighbors or by Jenner Vacation Rentals staff. With written approval, most rentals can accommodate up to two additional day guests. Located in a peaceful and serene area vacation homes are in proximity to neighbors. Please be respectful of neighbors relative to any loud noise. Vacation Rental Owners and Housekeeping Contractors maintain and clean properties to the best condition possible. Jenner Vacation Rentals does not provide refunds for issues beyond our control such as an appliance malfunction, TV/Cable or Internet blackout, power outages, etc. If there is any issue regarding the condition of premises contact Jenner Vacation Rentals immediately. Report any broken, damaged or non-working items upon your arrival or during your stay by calling Jenner Vacation Rentals right away. Applicable charges will be applied for any damages incurred by occupant, guests or pets. If a problem occurs during your stay call Jenner Vacation Rentals and leave a message if after business hours. An emergency phone number will be provided on the specific vacation home information sheet for emergencies only. (Note; TV, Internet, hot tub, etc. are not emergency issues and will not be addressed until the next business day). See guest directory for emergency and non-emergency issues. A professional hot tub company services Rental Homes with hot tubs weekly. If hot tubs are used correctly there will not be a need for an additional special service call. The hot tub rules are posted on a house laminate, in guest directories as well as outlined here. How to use the hot tub correctly-It is critical that all person(s) using the hot tub are clean before entering the hot tub. That means showering and/or bathing before entering the hot tub. Body oils, dirt, lotions, and other residue will cloud the water in a short period of time. This requires a need to drain, clean and fill hot tub. Failure to shower or bathe before using hot tub can result in a $170 fee ($70 to drain & clean spa and $100 for a special service call, if needed, before the next guest arrival. Any articles brought into and left in the hot tub such as toys, small towels, shower caps, etc. can clog jets and filters resulting in additional charges as described above. It is also critical that hot tubs are not turned down or unplugged during stay or that buttons are not pushed without reading operating directions and rules laminated at vacation home. The hot tub is checked for warmth and water conditions before each guest arrival. Photos are taken of hot tub after guest departure if a drain & clean is needed. With the cool ocean/river breezes, air conditioning is not needed in any Jenner Vacation Rental homes. See specific vacation home information for heating source. If a wood-burning stove is the only source of heat, wood will be provided. If not, guest to provide wood to burn for ambiance in fireplaces & wood burning stoves. Jenner Vacation Rental homes offer nationwide unlimited domestic long distance calls. No international calls. Cell service is not available along the north pacific coast and should not be relied on during vacation stays. Jenner Vacation Rentals with Satellite Internet service offers browsing and checking email only and cannot accommodate upload or downloads of any size. Instructions on how to use TV are posted by each TV. Internet passwords are provided in guest directories. Guests are responsible to clean BBQ grills after each use. Propane tanks are filled as needed or when reported empty by guests. Contact Jenner Vacation Rentals upon arrival or during stay if a propane tank needs filled during your visit. Key Replacement for Misplaced or Lost Keys: Call Jenner Vacation Rentals during business hours or the emergency number if after hours (located in guest directory & specific home information). $75 charge for this service. Blocked Plumbing: Toilets and sinks are tested prior to guest arrival to verify they are in working order. Guests are responsible for repairing plumbing blockages. The guest directory will have plumber contact information if needed. All vacation homes have private septic systems so using toilet paper sparingly and not flushing anything other than TP will keep toilets unblocked. Left Items: If we are able to find any items left behind and return is requested, a $20 handling fee plus postage will be charged for all items returned. Power Outages: When an area power outage occurs, PG&E contact information for power outages is listed in the rental homes Guest Directory. If a house or partial power outage occurs, check the breaker panel (info also in Guest Directory). Jenner Vacation Rentals & vacation homeowners welcome feedback & suggestions given through email to [email protected] All comments, feedback, and suggestions will be reviewed & responded to by Jenner Vacation Rentals and rental homeowners. Housekeeping fees cover costs to clean homes after guest stays, stock consumable supplies, and launder linens/towels as provided. Linens/Towels are provided at each vacation home except Hummingbird Cottage (Bring Own). All beds will have sheets, pillowcases, and comforters or blankets/bedspreads. There will be hand towels in kitchen, bathroom(s), and washcloth/bath towel for each guest on beds. A specific amount of time is needed to clean each vacation home before next guest arrival. If additional cleaning time is needed after guest stay, additional fees will be charged at $35 per hour based on the time needed to complete housekeeping tasks. Housekeeping Services will place and refill consumable supplies such as soaps, trash bags, initial supply of toilet paper (1 extra roll), and 1 roll of paper towels for each guest stay. Guests to provide additional supplies as needed. Garbage/Recycling: take all garbage to outside cans/bin & secure from critters. PERSONAL PROPERTY AND INJURYGuests’ personal property, including vehicles are not insured by Owner or Jenner Vacation Rentals against loss or damage due to fire, theft, vandalism, rain, water, criminal negligent acts of others, wildlife or any other cause. Jenner Vacation rental homes are located in areas inhabited by a wide variety of wildlife. 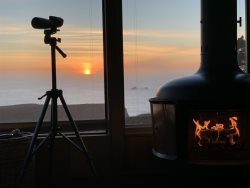 Guests have spotted one or more of the following wildlife to include bobcats, fox, badgers, raccoons, coyotes, ospreys, eagles, harbor/elephant seals, cattle that have broken through ranch fences, wild pigs, scorpions, ticks, black widow spiders and other. While sightings may be beautiful and/or scary, be aware of dangers and take appropriate precautions. Inform Jenner Vacation Rentals of sightings of any harmful wildlife in, on or around your vacation home.